Home / Plumberex Specialty Products, Inc. Saves more Time & Labor than Mulitple Piece Installations! Internal Tear Lines Wont easily tear during call-backs, installation or maintenance! Competitors require hassle of complete unit disassembly! NEW ! Snap-Lock Fasteners Smooth Non-Abrasive Wont Break Off! 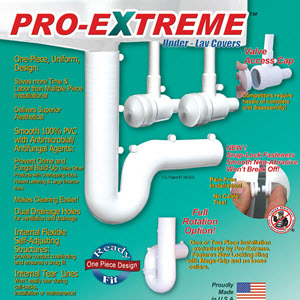 One or Two Piece Installation exclusively by Pro-Extreme. Features New Locking Ring with Mega-Grip and no loose collars.